I’m both a supporter and a skeptic of the doctrine of political framing as promulgated by Berkeley linguist George Lakoff in his now famous book, Don’t Think of an Elephant. I’m strongly supportive of the notion of framing insofar as it stresses the craft, once popular but now relegated to arcane debate exercises, of shaping language to convey appropriate and useful connotations along with the strict denotations of words. I’m skeptical, however, of the doctrinaire methods employed by Lakoff and his disciples in attempting to isolate and typify specific frames, including the use of brackets, categories, and seemingly meaningless keywords. Such tactics cannot, I feel, be successful in convincing the public that the framer is genuine, a critical factor in winning the long-term support of the populace for a political platform or party. I believe the public can spot a phony a mile off, and while they may vote for it, they will most certainly never respect it. Perhaps the most successful framer of the past twenty years was Bill Clinton, who uttered phrases such as “building a bridge to the twenty-first century” only after thoroughly poll-testing them against other similar phrases; perhaps as a result, Clinton may hold the distinction of being the most popular president of the twentieth century who was never actually liked. Despite their dogmatic shortcomings, the studies of framing published in recent years both on and offline have added much to our understanding of how language intersects with such critical concepts as power, patriotism, and affinity. It’s long past time for the concept to be applied directly to the past as it has to the present. 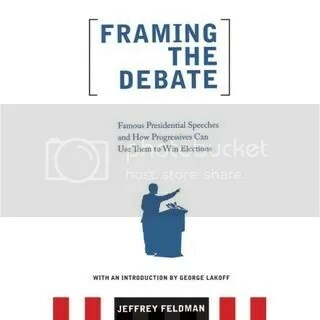 Jeffrey Feldman gets the ball rolling in his book Framing the Debate: Famous Presidential Speeches and How Progressives Can Use Them to Change the Conversation (and Win Elections) (a steal at $14.95 cover price; you can also read the first chapter online at NYT, though you’ll have to have a login to do so). Feldman, the most prominent of Lakoff’s online disciples and the proprietor of Frameshop, borrows Lakoff’s rigid linguistic techniques, but he brings his own astute understanding of practical politics to the project, a skill which has been sorely and noticeably lacking in Lakoff’s books. The result is a well-written book that is both readable for a general audience and potentially important to the study of presidential history. Feldman makes no bones about the purpose of his work: “Having applied lessons in cognitive and narrative science to framing political debate,” he says, “the crucial next step for progressives is to ground their framing efforts in the tradition of American political speech.” The book is intended for a progressive, not a historical, audience, a fact evidenced by its slight bibliography and by the predominance on that list of more works by more popular historians such as H. W. Brands and Shelby Foote. Nevertheless, in some ways Feldman’s focus on popular history can be seen as a necessary corrective to a scholarship all too often obsessed with arcane theoretical interpretations of American political discourse. And, after all, what is more directly relevant to American political consciousness than the presidential speech? After articulating a five-step process for the “practice” of framing, Feldman analyzes fifteen historical presidential speeches through an astute implementation of framing techniques. Feldman’s method of analysis, while too regimented and structured for my tastes, takes a unique and important view of the speeches by analyzing them from the treble perspectives of politician, activist, and citizen — an acknowledgment that the presidential address touches all these groups equally. Accordingly, old standards such as Lincoln’s Gettysburg Address and JFK’s “Ask Not” speech are afforded fresh interpretations (Lincoln’s as a paean to populist equality, Kennedy’s as a “personification of service” through “repetition”), while speeches by Nixon and George W. Bush are mined for arrogance and successful negative framing. Feldman seems particularly fixated on the frame of “government as a person,” discerning the theme not only in Kennedy’s Inaugural but in Washington’s, Jefferson’s, and Clinton’s as well. (His description of Clinton as “one of the most gifted public speakers of any President in recent times” may rankle, however, with liberals and conservatives alike.) Though he encourages political leaders to rhetorically remake government in their own image, Feldman counsels against the “communications gimmick” of “plant[ing] ordinary citizens in the audience and then refer[ring] to them during a speech,” arguing that the practice is tantamount to “gesturing to the people, while taking away their voice.” He finds an alternative to this method in an unlikely place: Jimmy Carter’s 1979 address to the nation. “Carter’s speech was both passionate and heartfelt,” says Feldman; the key to this remarkable flair, in his view, was Carter’s reliance on reading out loud the comments he had received at town hall meetings. In making this argument, Feldman rightly recalls Carter’s impressive rhetorical ability, a skill which has until now been lost to political memory with the President’s resounding 1980 defeat. Still, several of Feldman’s picks do exemplify the best of liberal visioneering. Perhaps his two most potent analyses are of Woodrow Wilson’s War Message and Lyndon Johnson’s Great Society address. Feldman avoids the greenhorn’s mistake of seeing Wilson’s call-to-arms as functionally equivalent to Bush’s Axis of Evil speech; instead, he recognizes the power of Wilson’s rhetoric “to help progressives once again lead the debate on national security.” Wilson’s ability to identify “the American principles that are under threat,” not just “the national security dangers that America faces,” made his words uniting rather than coldly divisive. And Feldman sees beneath the “society” terminology of Johnson’s platform to its underlying frame of “building,” using construction-based phrases to indicate the piece-by-piece construction of the Great Society. Feldman’s analysis here is no less searching than the original, all-encompassing speech itself. If its overly rigid framing techniques and occasionally questionable selections keep Feldman’s book from being a definitive work on presidential speechmaking, they do not by any means mitigate its importance. Framing the Debate is required reading for political junkie and presidential strategist alike, but it is perhaps an even more critical read for members of the historical community. It is a needed first step in demonstrating that presidential rhetoric impacts not only the intellectual but also the cultural realm, that it touches Americans from all walks of life in a myriad of ways. The American people, of course, have known and acknowledged this impact since it began; it is time we historians caught up with their understanding. We could do far worse than beginning this journey through Framing the Debate. This entry was posted on Saturday, October 6th, 2007 at 8:39 pm and is filed under Uncategorized. You can follow any responses to this entry through the RSS 2.0 feed. Responses are currently closed, but you can trackback from your own site.